Trial and full licenses use simple (iLok) computer-based authorization. This means an iLok USB key is not required (but can still be used). VocALign Project 3.3 is a latest version of VocALign and will authorize all of the following versions: Audio Suite, AAX, AU and VST3 plug-ins as well as a stand-alone version. It supports Pro Tools, Logic 8 and 9, Cubase and Nuendo. 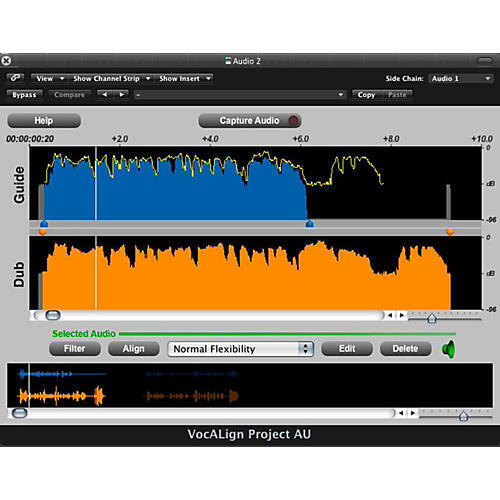 When you purchase VocALign Project 3 you can use both the Audio Unit and Audio suite plug-in versions of VocALign. You can easly transfer your authorization with your iLok between systems. Project 3 is an affordable audio alignment tool for music and post-production. Apple Logic 8 or higher software.